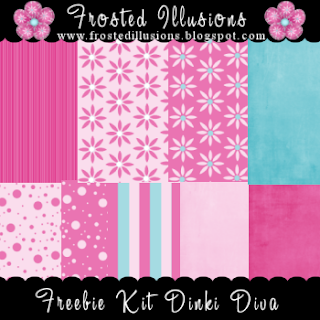 Frosted Illusions: Freebie Kit "Dinki Diva"
Lovely kit :-) Thank you! Thanks for sharing this kit. It looks amazing and I love the colour combo. Just found your blog. This kit is so pretty. Love the colors. Thank you for sharing. Thank you for the lovely kit. Please don't let these other nasty people put you off, you have a great talent. Keep up the good work and thank you once again.